Sir Arthur Wynne Morgan Bryant, CH, CBE (18 February 1899 – 22 January 1985) was a British historian and a columnist for the Illustrated London News. His books included studies of Samuel Pepys, accounts of English eighteenth- and nineteenth-century history, and a life of George V. Although his scholarly reputation has declined somewhat since his death, he continues to be read and to be the subject of detailed historical studies. He moved in high government circles and his books were devoured by the ruling elite, including prime ministers Churchill, Attlee and Wilson. Bryant’s historiography was based on an English romantic exceptionalism drawn from his nostalgia for an idealized agrarian past. He hated modern commercial and financial capitalism, he emphasized duty over rights, and he equated democracy with the consent of “fools” and “knaves”. Arguably the REAL real Arthur Bryant was the godfather of Kansas City BBQ. 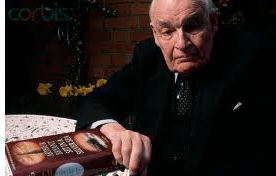 The historian Arthur Bryant was a fascinating old chap – he attended Colfe’s school for a speakers day back in the early eighties when I was there and discussed his books and particularly the Roman era. One of a number of interesting speakers we were fortunate to get to see.